These questions have been topics of conversation in my home and with friends over years of Odyssey of the Mind, Science Fair projects, STEM classes, robotics, and more. Why? Because it is good setting them up for challenging situations. 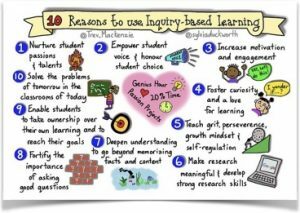 The graphic by Sylvia Duckworth shares 10 reasons to use Inquiry-based learning. This kind of learning begins with questions that have no obvious answers and which lead learners to find solutions to real problems. Teachers shift role to facilitator as students discover their own unique paths. Being a parent in this learning situation requires me to allow my child room to try, to experiment, to search. 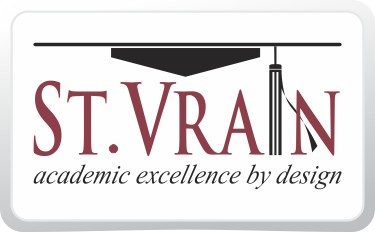 Yes, I want my children to have a strong foundation of skills, but it was through Inquiry-based learning that they found the purpose for refining these foundational skills. I see the benefits of passion, voice, motivation, curiosity, and grit in my children’s lives and in classrooms daily. Supporting my child can be a challenge. Remembering a few question patterns can help me support my child as they discover new learning. Is this new learning for them? Just because I might know an answer doesn’t mean I need to give it. Exploring doesn’t always lead to a right answer but is part of the process. How might you (change, adapt, improve, use, apply)…? This type of question encourages creative thinking. In what ways…? Plural language encourages connections. What do you predict…? Prediction requires analysis and making connections between what is known and unknown. How might others see/use/apply…? Seeing a solution from a different perspective deepens thinking. When I walk through schools and see students engaged in solving problems and connecting to the world outside their classroom, I see elements of the 10 reasons. When I see tools such as iPads, Spheros, video creation, programming and app development, I am reminded of how dynamic learning can be. I don’t need to know all the answers as a parent; some good questions may be just as important.